Original Sheet Music with lyrics for 23 songs . . .1906-1908 were years of Zigfeld Follies, Broadway, vaudeville, and barbershop quartets. This collections includes "Cuddle Up a Little Closer", "The Glow-Worm", "On the Road to Mandalay", and many other popular songs. 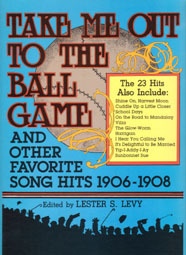 The original sheet music came from the collection of Lester S. Levy, the Enoch Pratt Library in Baltimore, and Johns Hopkins University Eisenhower Library.